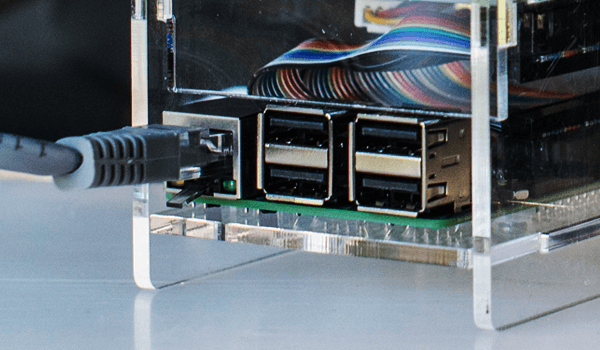 The CandyBox is a hardware control unit designed and made by Suitest for operating TVs, set-top boxes and other devices through their infrared port. A single CandyBox is able to operate up to 40 devices independently and you can have as many CandyBoxes as necessary in your Suitest account. Order the CandyBox through your account. If you are looking to operate Android TV devices or the Xbox One console take a look at SuitestDrive instead. The companion mobile app allows you to control and manage your Suitest devices right from the palm of your hand. Download it for iOS and Android, then use your regular Suitest credentials to login. 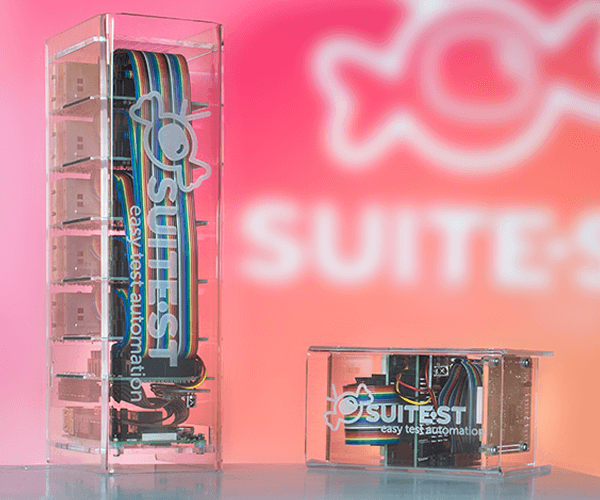 Suitest CandyBox variants - 8 and 40 control ports. Make sure to select a location in the room for the CandyBox where it is visible. The CandyBox contains a built-in infrared recorder in order to allow you to record a driver for your device. For that, the CandyBox needs to be in sight. The CandyBox has the power socket on the right side (when the Suitest logo on the CandyBox is facing you). The network socket is located at the back in the bottom left just below the 8 or 40 infrared control ports. Internet cable plugged in into the correct RJ-45 socket. Attach the network cable to the bottom left RJ-45 socket. WARNING: Do not plug in the network cable into any of the numbered control ports. This could damage the box or your network equipment. The network cable must be plugged into the bottom left RJ-45 socket which does not carry a number. Plug the power cable into the socket which is located on the right side (when the Suitest logo on the CandyBox is facing you). Once the CandyBox is plugged in, you will see the bottom board power up (red and green) then the network socket (green). After about 30 seconds the control ports will start blinking orange, this means the CandyBox is fully booted and ready for use. Now go to your account and open the control units tab. You should see your CandyBox listed there. The CandyBox status should be online and you should be able to see the list of infrared emitters. The control units page - CandyBox is online. The CandyBox is a device that needs to be on and online all the time. There is no need to turn off the CandyBox through the night or during non-business hours. On the contrary, you'll want your devices to be accessible all the time, so just leave it plugged in. Once you see the CandyBox as online in your account, you can start furnishing your devices with the infrared blasters. Locate the position of the infrared receiver on the hull of the device. (Try pressing and holding a button on the device remote and watch out for a blinking light. The receiver is usually located in the place where the light comes from). Stick the coupler end of the Suitest infrared blaster into convenient position at the back of your device. Peel off the protective foil from the back of the Suitest infrared blaster and then stick the blaster onto the infrared receiver. 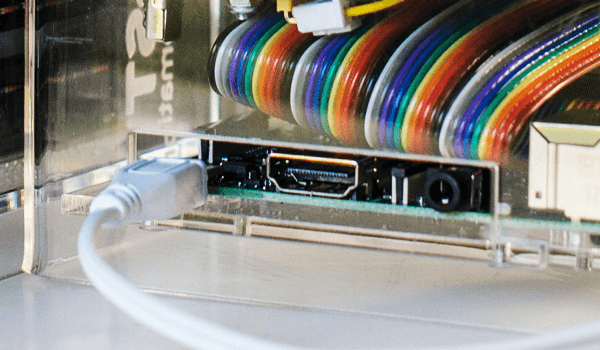 Insert a network cable into the coupler and plug the other end into the CandyBox. CandyBox port 1 is shown as READY after attaching the blaster. In the CandyBox management area of your account, you will be able to see the status of the unplugged infrared blasters. The infrared blaster which you have just plugged in should have the status READY. After you have finished configuring the CandyBox launch the Add device wizard to configure your first device. Configuring HbbTV or Freeview Play devices. Configuring an LG webOS device. Configuring a general purpose Smart TV device. READY - A blaster is connected to this port and everything looks right. NO BLASTER - The port is OK but there seems to be no attached blaster. If the blaster is physically connected this message implies that either the cable or blaster itself may be broken. Try replacing the cable first and check if the status changes to READY else replace the blaster. PAIRING - The blaster on this port is currently being used in the Add device wizard. PORT ERROR - The control port is malfunctioning, please reboot the CandyBox and if the issue persists contact support.